A lot happened this past week. @brauner is making great progress cleaning everything up in liblxc and related projects ahead of the 3.0 release, @freeekanayaka has been sorting out the last few missing bits for LXD clustering and @monstermunchkin has been busy working on our new distrobuilder tool! 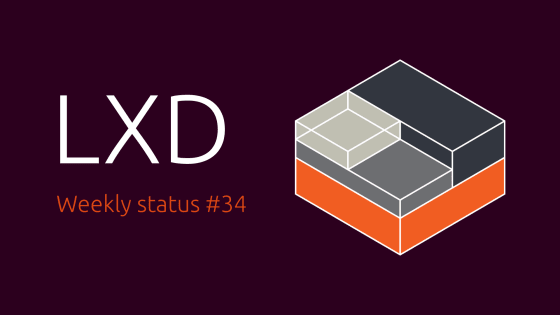 On top of all that, we’ve landed a variety of smaller features in LXD based on past user requests. This includes support for retrieving symlinks, setting a custom gateway IP address on a LXD network, retrieving the list of DHCP leases through the API, a new subcommand to manage client aliases, a new subcommand to override a device coming through a profile and an option to get prettier log output through lxc monitor. We’ve also fixed numerous issues and done a number of tweaks to our snap package. At the request of some users, we’re now including nano as an alternative to vim. Image updates now benefit from delta transfers and we’ve added a number of new debug subcommands and other small improvements. The recordings of all our talks at FOSDEM 2018 are also available online now so you may want to check that out! Implemented retrieving symlinks over file API. Added a new ipv4.dhcp.gateway option to networks. Fixed a typo in the lxc storage help. Added a new API endpoint to retrieve the list of DHCP leases. Added a new lxc alias subcommand. Added a pretty rendering mode to lxc monitor. Extended the user agent to include the list of storage backends in use. Fixed handling of --version in lxc. Added a new lxc config device override subcommand. Switched the testsuite to using lxc.apparmor.profile. Made the testsuite backward compatible with LXD 2.0.x. Updated the tools to only use public symbols1. Added new lxc.namespace configuration keys1. Fixed logic for unprivileged containers in lxc-ls1. Fixed remount flags in cgfsng. Fixed broken network in nested LXC containers1. Fixed a number of issues reported through coverity. Fixed error handling in userns helper. Fixed clearing of cgroup settings. Dropped some unnecessary locking around our console handling code. Removed some legacy (pre-3.0) codepaths and options. Fixed a hang in lxc-console. LXD 2.21-0ubuntu3 was backported to Ubuntu 16.04 and Ubuntu 17.10.